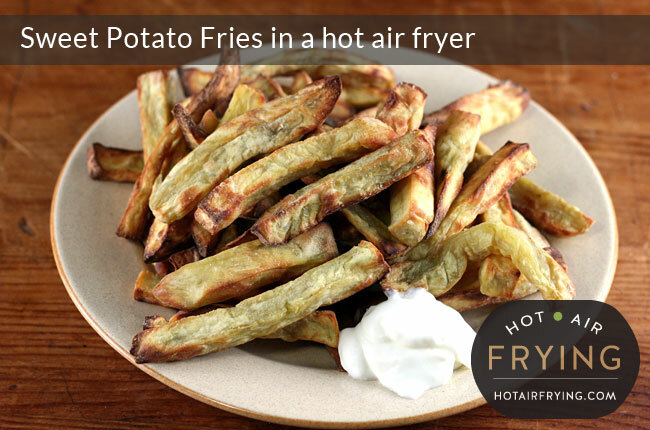 Sweet potato fries for many people is the holy grail of hot air frying. As usual, first the recipe, then the discussion afterwards. Wash the sweet potatoes. Peel. 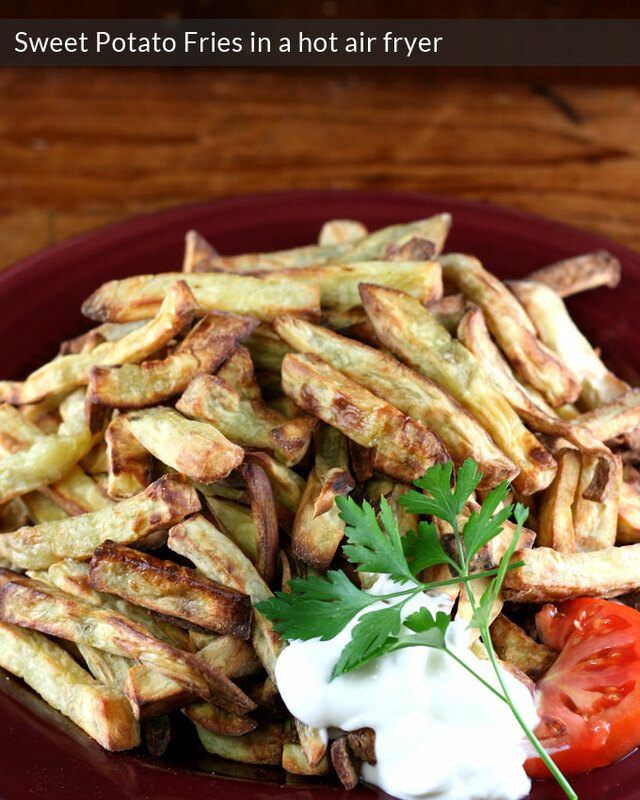 Cut into fries / chips. Put into a large bowl. Cook (no need to pre-heat machine) at 160 C (320 F) for 15 minutes. Take out the fries and tip them back into the bowl you have been using. Toss them in there briefly and gently using a large spoon, or just by tossing the bowl. 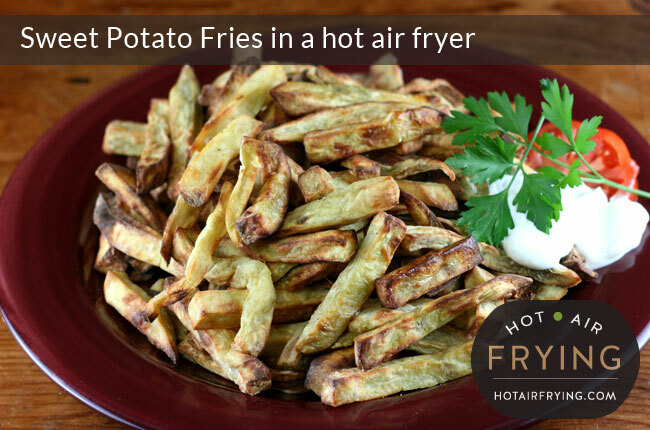 Transfer fries back into fryer basket. Place back into machine, raise temperature on the machine to 180 C (350 F), and cook for another 5 minutes. Any leftovers are best reheated in machine. The quantity in this recipe accounts for the max capacity of a Philips AirFryer™ basket, which is 8 US cups in volume (900 g / 2 lbs) of uncooked sweet potato fries. Feel free to cut the quantity in half, but don’t try to cook more in one batch. If you do cut the quantity in half you may need to reduce the cooking time a bit at the end. In various experiments with this recipe, at one point I was left with half a batch (4 cups uncooked / 450 g / 1 lb ) already tossed in oil, that wouldn’t fit into the machine. Rather than put them in water, I left them in the tossing bowl and sprayed the top with cooking spray to prevent browning. I used white sweet potatoes because I got these four (pictured above) weighing a ponderous 1.5 kg at a farmer’s market table for just a buck. They used to be far more prevalent in the northern US and Canada because they grew better in those regions. Fries made from white sweet potatoes will be a bit less sweet, and fluffier, than fries made from orange sweet potatoes. 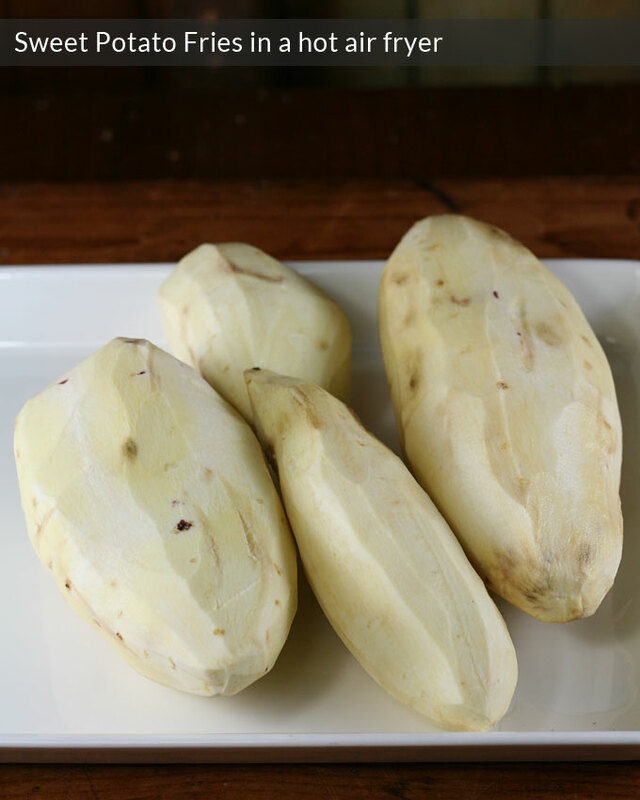 White sweet potatoes are called “camote” in some parts of Latin America, where they are more popular than the orange ones. Please use whatever you wish — the white or the orange! Both will work. I do not know about eating the peel of sweet potatoes; I will research sometime to see if other people eat it, but right now it doesn’t appeal to me. I do know, however, sweet potatoes once peeled will brown on you almost as fast as you can look at them. So you have move fast once you start working with them, having a plan and being able to follow it through without interruption. It’s not the end of the world if they do brown — after all, we’re hoping to brown them in cooking — but still. Above you saw them about 5 minutes after peeling and you will have noticed some browning already. If you need to pause at this point for any reason, get them in a pot of cold tap water, enough water to cover them completely. Next comes the question of cutting the potatoes into fries. You can use a chipper, but be sure it is a good sturdy one that you trust to stand up to a lot of force, and can truly secure to a work surface, as you are going to have to really lean on it. I mean really lean on it. 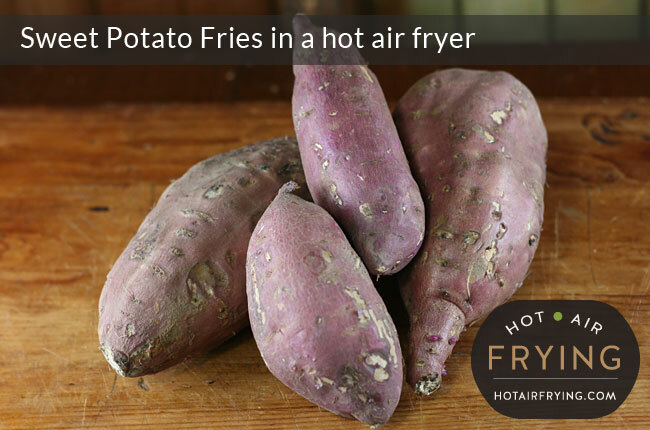 The contradictory nature of sweet potato fries is that unlike potato which is relatively soft and reasonable at going through a chipper and then firms up and crisps when cooked, sweet potatoes are harder than rocks when raw going through a chipper, but can go very soft and mooshy when cooked. The operative phrase from above there right now is “hard as a rock.” Literally. If you are not sure your chipper can stand up to the level of brute force you are going to have to exert, then don’t risk breaking your chipper over it. Use a knife instead but be wary of the knife slipping on you: this stuff is as hard as cutting through a squash rind. If you are cutting a large amount of sweet potato fries at once, or will be cooking them up later, get them covered in water in a large pot of water. Drain them well afterwards before proceeding. They could be fine overnight this way in a fridge, dunno. But I would set the bowl of water with them in it out a few hours before using to warm them up some. If you are moving onto cooking them right away, then put them straight into a large bowl that allows you enough tossing room. Now, add the 1 tablespoon of oil, and just using your hands, toss the fries around until they are all coated. Pictured: the fries, cut through a chipper and tossed in oil, awaiting cooking. Try making this recipe first with just the 1 tablespoon of oil; that should be enough for most people’s tastes. But the next time around, if that wasn’t, you could add a second tablespoon of oil, or, also spray the fries with some cooking spray. Instead of the oil, you could use 1 tablespoon of duck or goose fat that has been zapped in the microwave for about 10 seconds: just enough to melt it without making it hot. All the hard work and thinking is done now, the actually cooking of them is easy. Take out and serve piping hot. 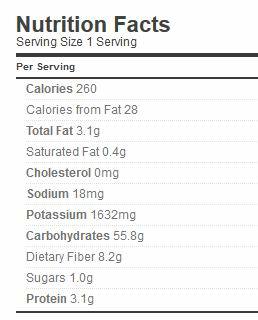 260 calories per 1 cup (90 g / 3 oz). Weight Watchers PointsPlus®: 5 points per cup (90 g / 3 oz). Total Weight Watchers PointsPlus® in the recipe are 22. Interesting that you peel sweet potatoes. I grew up being told that all the vitamins were crowded near and in the skin; consequently, the only thing I peel is the stems of woody-tough broccoli. Now, “scientists” tell us that the veggie skins’ vitamin density is a myth. (We’re also being told that vitamin supplements are useless at best and toxic at worst.) What’s an old hippy/health food guy to think? Anyway, between archaic beliefs, a fondness for roughage, and sheer laziness, I’m going to keep eating tater skins, boiled, baked or Hot Air Fried. Old dog, old tricks, I guess. Can I fry chicken dipped in milk and egg then dipped in flour in the oil less fryer? Just bought mine. I appreciate help. Hi Patty, you left your comment on the sweet potato fries page, so I don’t know what kind of oil less fryer you have…. What is the benefit of washing the sweet potatoes if you then peel them? For root vegetables particularly, most of the bacteria is on the skin. Additional contaminants could have landed on the skin through harvesting and shipping by workers with unclean hands, etc. If you peel an unwashed vegetable, you are driving any of those surface contaminants into the flesh of the vegetable while peeling. By washing first, you are reducing the bacterial load before starting. If you are going to eat unpeeled, scrub well to reduce the bacterial load on the skin. In this era of salmonella and listeria etc cross-contaminating everything in the backrooms of stores, it can pay to spend a few extra seconds to practise food hygiene. 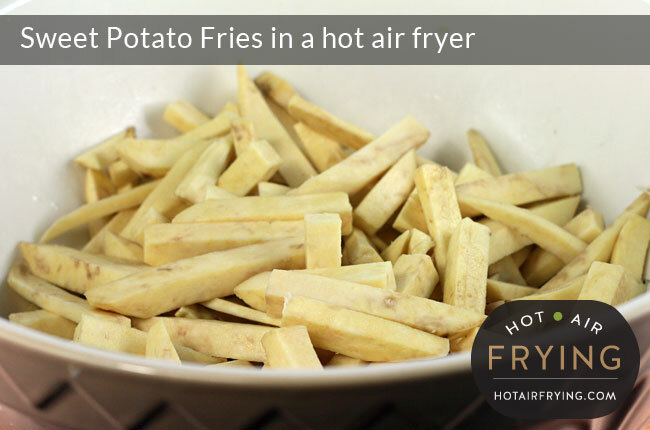 Can you use the airfryer without adding the oil at all? What would the white sweet potatoes turn out like? (we only have the white ones in South Africa). Have you tried it?